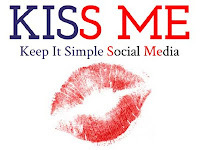 It's short for Keep It Simple Social Media and all I want to do is try to explain as 'simply' as possible what steps you should be doing to improve how your business performs on the Internet. It's not an idiots guide because you are not idiots but the pace of change in digital marketing and in particular Social Media can be a challenge to all. However follow these simple rules and you will see real benefits for your business. Google is where 90% of ALL searches start. If you want people to find you then Google needs to know you exist. If you do these 4 simple things then people will find you more easily on Google. Which means that you will get more enquiries. Simple. The rise of Social Media has been so rapid that many businesses - particularly the smaller ones - feel completely overwhelmed. Do I need ALL these new social media networks? How do I find time to resource all of this, let alone learn it all? Can't I just rely on my traditional marketing? Through the KISS ME series of presentations I will be breaking down some of these barriers and pointing you in the direction of some simple actions that could make a big difference to your business. If you like this please share by clicking on the Social Media icons at the top of the article - thanks, Martyn.